Here you can see extra info that’s provided when hovering over the Create Polling button on the Electoral Vote Info Screen. Similar sorts of info are now available when hovering over the Create Targeting, Org. Strength, and Footsoldiers buttons. This clarifies exactly how these parts of the game work, and does it at the point of player decision, which I find relatively intuitive. My goal is to make the game mechanics more obvious without resorting to an external help file. Here you can see how the polling ‘days to create’ is at 4.5, because the player’s Polling campaign attribute is 8. Not just personal attributes (Leadership, Experience, and so on) but also campaign attributes (Command, Strategic, Polling, and so on) are now 0-10. In this case, because it starts at 4.5 completed, it only costs half of the CPs for the last day (so, 0.5 CPs). A note on creating campaigns using the new 0-10 attribute system. With new versions going forward, the Editor will use the 0-10 system for attributes. However, the game will encode both 0-10 and 1-5 (automatically generated from the 0-10 values) in the campaign files, so people playing older versions will still be able to use the campaign, even though it’s designed for 0-10. This is great. 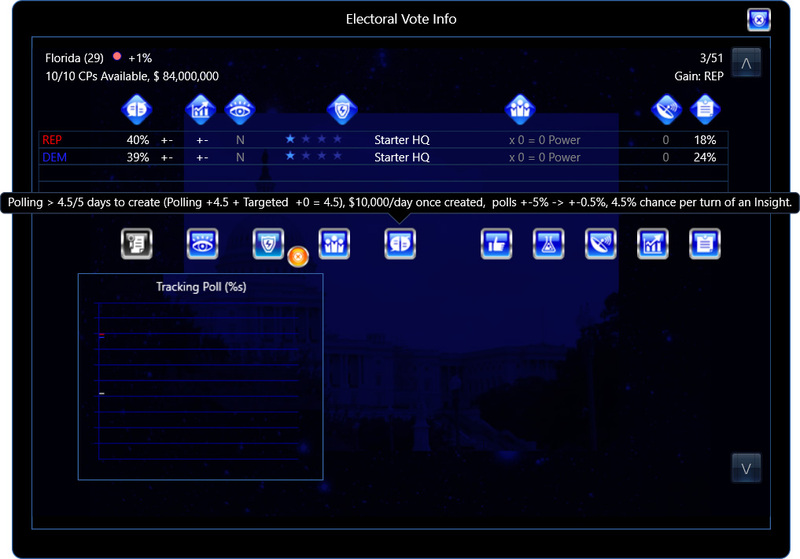 One thing I just thought of that I would like to have back in the game is a prediction screen where you can play around with the percent’s and see how it would affect the election like in the first game. Ya, the prediction screen is neat – we’ll see. Thanks for this.